Despite being a whopping 51 years old, Joseph Heller's Catch-22 remains an American cultural touchstone. Whether you've read it or not, you've been party to its signature Catch-22, now a philosophical concept summing up the old "damned if you do, damned if you don't" paradox. But it's more than the titular catch. Heller's novel, a cornucopia of satire, reaches into the majority of the best (I'll qualify the best as the most critically acclaimed) entertainment in pop culture. You can see Heller's satirical influence in each episode of 30 Rock or Community, as well as inside the best of Wes Anderson's films. Not to mention, of course, the long-running M*A*S*H. Big characters, confusingly chaotic scenarios and conversations that are at once hilarious and revelatory fill the pages of the book. And while Heller keeps things purposefully confusing, mirroring the chaos and nonsensical nature of war, his cartoonish, but believable characters confront stark, horrifying, delightful, and cogent facts about human life. Where The Walking Dead went wrong all over Season 2, spending time discussing the issues directly, Heller's Catch-22 features philosophical developments that come from conversations that aren't even pointed toward such ends. In short, Heller's novel is a finely tuned machine, made so much more obvious by how un-fine and un-tuned World War II is presented. There are definitely more than 5 total life lessons in Catch-22, but if the internet has taught us anything, it's that we don't much care for long lists, unless they're episodic, include Firefly's Nathan Fillion or Buffy and Dollhouse alum Eliza Dushku, or happen to feature cute animals in cuter-than-or-equally-cute-to hats. 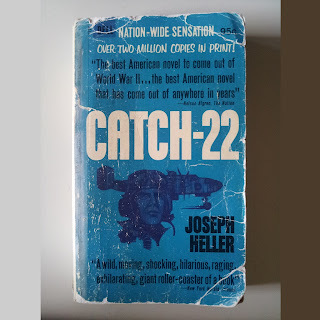 So, here are 5 things we can still learn from Catch-22. It's crazy to follow the rules all the time, but it's crazy not to follow them sometimes. Yossarian's novel-long quest to get out of the war leads him into numerous confrontations with mission-raising Colonel Cathcart and the titular catch. Our protagonist finds safe and reasonable ways to hide from an unfair war, either by checking into the hospital, running around naked, or escaping into lots of carnal activities with prostitutes and even the wife of one of his commanding officers. Yossarian fears that he's going insane, but he fears dying more, and all of his "crazy" behaviors serve to keep him sane, arguably MORE sane than the rest of his squadron. The trick is that Yossarian also knows when to abide by the rules, too. His moral compass remains finely tuned. He follows the rules of life and of love for humanity, fighting to save Nately's Whore's kid sister, and to punish the men who stand to gain most from unjust situations. People, Places, and Events are always more than meets the eye. The squad camp at Pianosa isn't a well-oiled military machine. It's a summer camp for kids playing as men in uniform. Rank in Catch-22 more often than not gives reason to mistrust rather than to assume experience and clarity of vision. Major Major is promoted just because. Yossarian receives Captain for making a mistake that gets men killed. Colonels Cathcart and Korn want only to become Generals for the title, not because they wish to serve better. Milo's syndicate is a business in name only, an elaborate scheme of moving materials to make him a personal profit and get whatever he wants. Even the squadron is not a cohesive group, a team. Instead it's a random assortment of ill-fitting pieces. Of course, then there's Washington Irving, the Chaplain, the soldier in white and the soldier who saw everything twice. For Heller the world is not what it seems, capped perfectly with Orr's epic escape from war by crashing on purpose and the disguises Nately's Whore wears as she pursues Yossarian. Capitalism and other institutions are often blanket excuses for free-reign corruption. Milo's syndicate runs amok, even playing both sides of the war, helping the Germans attack while coordinating a bombing on the Germans by the Americans. For Milo, it's always a matter of business. Business excuses all trespasses. The Military within the text operates the same way, built as a mechanism for high-ranking ladder-climbing, rather than as a system to keep men from harms way unless absolutely necessary. The fringes of society provide the most clarity, from the old man in the brothel, who tells Nately that Italy will outlast America in history, to the halls and wards of the hospital where men and boys at war are most free to be human. Death is Life. Life is Death. The key revelation for Yossarian comes from trying to save Snowden. It's the moment Heller calls Snowden's secret. And it's a secret only because we choose so often and constantly to ignore it. When Yossarian removes Snowden's flak jacket and the boy's viscera spill onto the bomber's floor, he is confronted with the truth of life. Life is a means of conveyance toward Death. No matter what our bodies show on the outside, youth, beauty, virility, survival, we are always dying. It's that moment that flips the switch in Yossarian that he won't fly anymore. He doesn't want to speed himself toward death, knowing full well that he's already on that trajectory. Heller's work with this sub-story specifically links to Julia Kristeva's Approaching Abjection. For Kristeva, we hate the things we hate because they remind us of our own mortality, limitations and failings. We, and Yossarian, are horrified by the sight of Snowden's drizzling entrails not because they look bad, but because we realize in that moment that we have that inside us, and that there's very little holding it in. We are weak, and we will die, no matter what we tell ourselves. It's better to die running toward what you love, than live a lie. It's the key message to the book's final pages. Yossarian has the option to return to the States, a rich, honored man, but he must tell everyone how heroic his experience of war was. To be free, Cathcart and Korn force him to maintain a horrible illusion. It's really an illusion we still maintain to this day, through war films and video games. We glorify battle and the destruction of enemies that are inherently "evil." Toughness and manliness have violence as a necessary quality. But, Yossarian chooses to avoid that lie. He chooses to run away, fighting a harder battle than the one he would fight by staying in the war, but one that is moral and guided by self-preservation and basic humanity. Given the options, he makes the infinitely more difficult choice. There's a chance that he could have returned to the States and never spoken to anyone about the war ever again, but simply by being there, recognized as a hero, he would be validating all of the corruption he fights throughout the text. The message is clear, go for what you love, and don't settle for the deal that keeps you comfortable, especially when your eternal soul is the bargaining chip. What's perhaps most sad is that the lessons we should have learned from this text and from World War II continue to go unheeded. And more so, the satire that Heller proposes throughout the text is more and more realistic every day. Probabaly no other novel other than the Jeeves/Berty Wooster series of PG Wodehouse has managed to make people laugh till their seams start bursting. The humour of this book will have you bursting at the seams. Its a satire of US Army Air Corps offices stationed in Italy during WW-II. The humour stems from the fact that critical issues concerning life and death are given no importance while trivial issues like clerical errors and idiotic judgements are glorified. As one reviewer pointed out that there is no structured storyline which might make some readers stop reading beyond inital few pages but believe me, read this book till the end and you will not regret your decision. A unique book, a masterpiece and rightly placed as one of the top 10 novels of the century.